I had chicken shish at a local Middle Eastern restaurant today for lunch. We decided to call that our main meal of the day and made breakfast for dinner. The best scrambled eggs I have ever eaten were at La Pyramide in Vienne, France. I think of them every time I make scrambled eggs. They were lovingly cooked for quite a while over a low flame while the eggs were agitated. 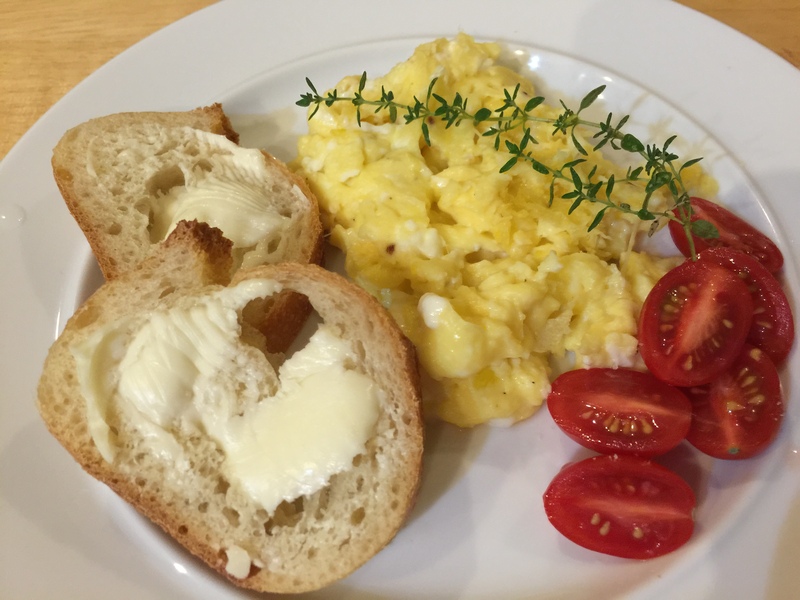 The result was a creamy dish of eggs with small uniform curds. I always start my eggs thinking I will cook them slowly but run out of patience and turn up the flame resulting in larger curds. This entry was posted in Eggs, Vegetarian and tagged breakfast, breakfast for dinner, Eggs, scrambled eggs. Bookmark the permalink.